Amazon.com description: Product Description: The articles by philosophers, philologists, and editorial scholars in this volume examine whether the ""aestheticization of thinking"" achieved in the writings of Friedrich Nietzsche and Theodor W. Adorno should be regarded as a key characteristic of philosophical argumentation. The aim is a reevaluation of philosophical reading and the development of a philological method that assesses each text in terms of its particular nature and materiality. 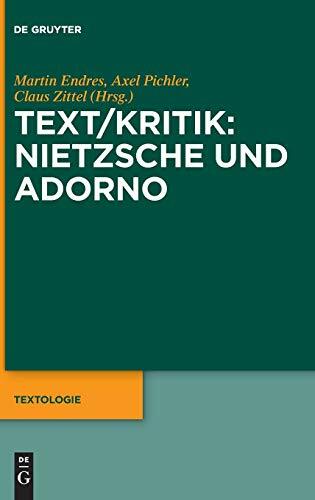 About: The articles by philosophers, philologists, and editorial scholars in this volume examine whether the ""aestheticization of thinking"" achieved in the writings of Friedrich Nietzsche and Theodor W.